High Quality OEM Style Replacements. 1 pair of Door Weatherstrip Seals. 1 pair of Door Jamb Seals. 1 set of Convertible Top Weatherstrip. Includes the Front Header Seal. 1 pair of Convertible Pillar Post Seal. 1 pair of Vent Window Seals. 1 pair of Glass Run Channel Seals. 1 pair of Rear Quarter Window Seals. 1 Hood to Cowl Seal. Please note this is a Soffseal part, made in U. Fits the following 2 Door Convertible Models. 1966 - 1967 Chevrolet Chevelle / Malibu / SS. KIT67 LM12J RR1609 CZ8107 WR2009 VR2009 VS3J ALP5000 5070 TK46-16. 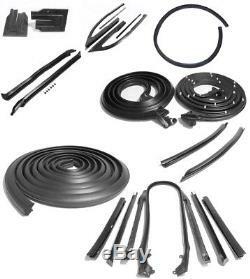 The item "66-67 Chevelle Malibu Convertible Weatherstrip Seal Kit 21 Pieces USA MADE" is in sale since Friday, November 17, 2017. This item is in the category "eBay Motors\Parts & Accessories\Car & Truck Parts\Exterior\Body Kits". The seller is "tamraz" and is located in Plainfield, Illinois. This item can be shipped worldwide.